Sometimes in mid-2005 Nairobi property magnate Gerishon Kamau Kirima, frail and crutching on his walking stick, limped into Nairobi’s Market Branch of Barclays Bank with a bag full of cash. He was alone. A few minutes later, a middle-aged woman rushed in and publicly admonished him for carrying large amounts of money along Nairobi streets. It was end month and it could have been money collected from his rental houses, which bring in more than Sh 17 million a month, according to court records. Few discerned that this was perhaps one of the wealthiest rags-to-riches Kenyans alive. Unlike other flashy millionaires, Kirima’s style of running business was rudimentary, just like the furniture he made in his early years. By the time he died aged 88 in a South Africa hospital while undergoing treatment on Wednesday, Kirima and his family had for the wrong reasons become the center of attention as the family fought in and out of court corridors for the control of his multi-billion real estate and other commercial ventures. It was a drama that had all the tenets of a soap opera: cash, witchcraft, back-stabbing, and litigation. Kirima hardly controlled it, and was more of a spectator, as old-age and senility caught up with him. Born in the tea-growing Kiruri village in Murang’a and on the slopes of Aberdares, Kirima was a simple man whose dressing, mostly v-necked sweaters with a suit, hid his business acumen and wealth, but revealed his humble backgrounds. Scrupulously honest, Kirima was also naïve politically always failing to read the mood. Part of it was borne of his little education background, having dropped out of school at an early age, and innate fear of wading through uncharted waters. As a person Kirima evaded the sophistry associated with millionaires, opting to run his business based on trust with his sons and daughters – and the first wife. At best he only trusted himself. Like many businesses registered in early 1960s, at a time when women inherited no properties, his empire was simply a masculine Kirima and Sons Ltd, exemplifying the weaknesses of the social structure that he was molded into. Like many of his age-mates who did not go beyond basic education, Kirima’s background is weaved around the colonial education structure that prepared Africans for menial jobs. That is how the self-made millionaire started off as a carpenter after he eloped from his Kiruri home and settled in the Kinangop plateaus. It was here that he started his carpentry workshop becoming one of the pioneer African businessmen. Kirima was mean albeit thrifty with the little money he earned. At the dawn of independence he would shift to Nairobi working as a pioneer carpenter at the Royal College (now University of Nairobi) and operating a small workshop in Bahati and later in Kaloleni where his first wife, Agnes would man as she brought up the children. It was the venture into meat and real estate business that would catapult Kirima into big business. The end of the state of emergency in 1960 and Independence three years later opened a rural-urban migration unprecedented in Kenya’s history. Kirima opened bars and butcheries across the African and Asian neighbourhoods, taking advantage of the new elite who had money and new jobs. The Africanization policy led by Commerce minister Dr Julius Gikonyo Kiano, who hailed from Kirima’s constituency also favoured Kirima as a young African entrepreneur. With Asian business targeted for closure and as rules were twisted to favour African businesses Kirima was one of the pioneer beneficiaries. In 1967, he had saved enough cash to enter into big real estate business and surprised many African elites, mostly ministers and senior civil servants in the Kenyatta government, when he bought 500 acres from Italian Donenico Masi in Nairobi. By then only Kenyatta and his family had managed to buy such land within Nairobi district. In the same year, Kirima bought two other large farms in Nairobi which included some 108 acres from British settler Charles Case and a further 472 acres from Percy Randall, the settler who sold most of his land to Magana Kenyatta in 1967. With such large tracts of land, bought from well-established ranchers and enough for ranching, Kirima was set for business as a big meat supplier. His main worry was that the Kenya Meat Commision, which was still commandered by British settlers did not allow meat from African farmers. As the chairman of African Butchers Association, a lobby group seeking permission to sell meat in the city, Kirima managed to have the Africans have their way- a move that saw him start a private abattoir in one of his farms in Njiru area of Nairobin and which partly led to the death of Kenya Meat Commision (KMC), largely seen as a colonial outfit. With Dr Kiano at the helm of the ministry of commerce, businessmen from his Murang’a backyard thrived by purchasing tens of properties in Nairobi’s River Road and from the vacating Asians whose business licenses to run retail shops were withdrawn. Also, as Asians lost their permit to run transport business, Kirima entered the business with his Kirima Bus Service competing with Dedan Njoroge Nduati’s Jogoo Kimakia Bus Service as the two leading African-owned bus companies in Kenya against established British company Overseas Trading Company (OTC) on the central Kenya route. But the Kirima bus company did not survive for long. When Kenyatta issued a decree that allowed Matatus to run transport business from Nairobi to other towns in 1973, Kirima and other transport entrepreneurs: Muhuri Muchiri, Kamau Mweru and Nduati were some of the first casualties of the stiff competition. While buses were licensed by the Transport Licensing Board, the matatus were exempted. Both Nduati and Kirima concentrated on real estate as they abandoned the bus companies. Those close to Kirima say he may have abandoned the business because he was a hands on man and always wanted to collect his money. It was in the real estate where Kirima built a solid empire mostly concentrating on low income rental houses in Eastlands. Kirima combined his business with politics. Having rose as a tycoon in the 60s, Kirima managed to get recognized among the African elites and his burial committee is an indicator of those who rubbed shoulders with. But even with that he was still a rural man. His children would still pick coffee in his farms, go around Nairobi collecting rent, and sell meat in their spare time. At the political front, Kirima was elected a councilor in Nairobi rising to became a deputy mayor. He later contested the Starehe seat after then then MP, Kiruhi Kimondo was kicked out of Kanu in 1989. With the clamour for multi-party politics, Kirima was the Nairobi chairman and he organized the Kanu brigades that manned most of the City bus-stops. It was these brigades that would later become the thuggish elements that haunt the Matatu industry in Nairobi today. The late Kirima did not win the Starehe seat in the 1992 multi-party elections and lost to Kimondo who defected to Kanu in 1994 leading to a by-election won by then Nairobi-mayor Steve Mwangi. A few months later, Mwangi quit his seat and politics, and Kirima won the seat on a Kanu ticket becoming the sole Kanu politician, and the only Kikuyu, to have won a parliamentary seat in Nairobi during Moi’s multi-party parliament. His appointment as an assistant minister was largely a reward. Away from politics, Kirima spent his time at his up-market Kitisuru home and at his K&S House opposite Jevanjee Hardens in Nairobi. It was from these two places that the drama on how to run the properties he had acquired for years was privately fought before it spilled into the courts and later to the streets. 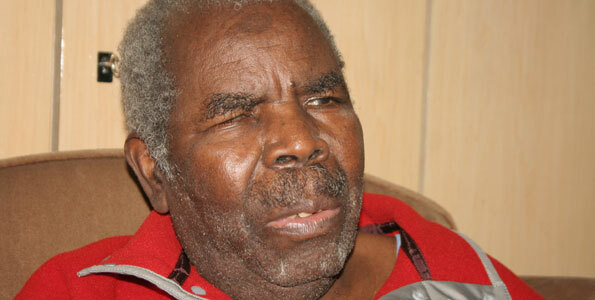 Diabetic and partially blind, Kirima died without resolving his estate rows. The pale grey gate at Kitsuru still hides much of the drama captured in some video footage by the daughters and sons of the first wife as they fought the third wife. Kirima had a second wife who stays in Kiruri village and away from the rows. With Kirima now dead, the battle to control his estate will begin in earnest. It will be bruising at best, and rough at worst. Good stoty bro. i didn't know that much about Kirima. Nairobi, Kenya: The son of a former MP Gerishon Kirima was yesterday fined Sh 100,000 by a Nairobi court after he pleaded guilty to the offence drunk driving. Prosecutor Noah Chemweno informed Senior Principal Magistrate Jane Mwangi of the traffic court that John Wanjau Kirima was driving on Jogoo Road on Friday night when he was flagged down by traffic and National Transport and Safety Authority officers at around 12 am on suspicion that the driver of the vehicle was drunk. Chemweno told court that when the accused was subjected to the alcoblow test, the gadget indicated he had consumed 0.96 mgl which was above the recommended limit of 0.35 mgl. He was later arrested and taken to Kamkunji Police Station where he spent the night until he was released on Saturday morning after paying Sh20,000 cash bail. The prosecutor informed the court that the accused was a habitual offender. Almost everyone dreams of owning a house some day. It may be a huge house or a small one or it could be anything, but everyone has a 'dream house' in their minds that they want to own.